Microsoft recently unveiled that the Windows Phone Store has about 145,000 apps available. 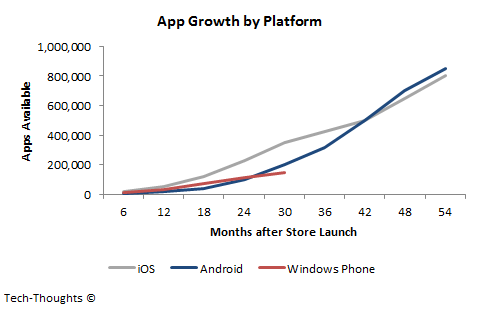 Based on this figure, app growth for the Windows Phone platform seems to be slowing. Windows Phone 8 was supposed to help drive developer interest, but has done nothing to stem this slowdown after being on the market for 6+ months. 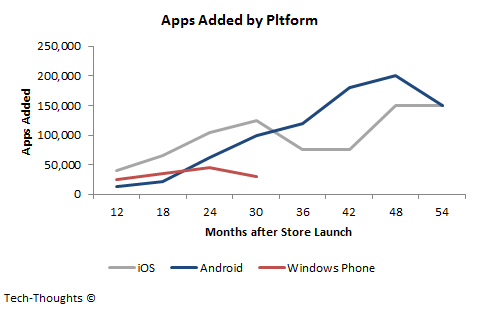 As the chart above shows, application growth in the Windows Phone Store (formerly the Windows Phone Marketplace) started off strong. Application growth was much greater than that for Android over the first few years (ignoring the population of mobile developers). However, while the application base on Android and iOS continued to grow, Windows Phone seems to have slowed. Since mid-2012, app addition on the Windows Phone platform seems to have flatlined. This is in stark contrast with app addition on Android & iOS over the same timeframe, even though the developer population at the time was smaller. iOS saw steady growth for the first 2-3 years, while Android has seen steady growth for the first 4 years. The unmistakable conclusion from these charts is that developers are losing interest in the Windows Phone platform (or possibly Microsoft's "Metro" platforms in general). My guess is that this is caused by a mix of factors - limited install base, low user engagement, monetization challenges and regional developer restrictions. Given the trend of platform concentration in the mobile industry, this could be a very challenging situation for Nokia and Microsoft to overcome. I've been saying for years that Microsoft's Developer Division should have embraced iOS and Android by offering .NET on those platforms and allowing developers to create cross-platform apps within Visual Studio. If they had done that and were successful at becoming the premier developer environment for mobile, they would have had an easy time getting all of those apps to run on Windows Phone.